During the Bundesliga winter break most of the clubs go on training camps, which in turn means there is always a good chance of getting some of the very best boot spots – and the last couple of days we have been bombarded with spots of new, coming football boots. Get the full overview here. Pepe Reina (Bayern Munich) – adidas Predator Instinct Solar Red/White/Night Flash They are good to us these Bayern lads. 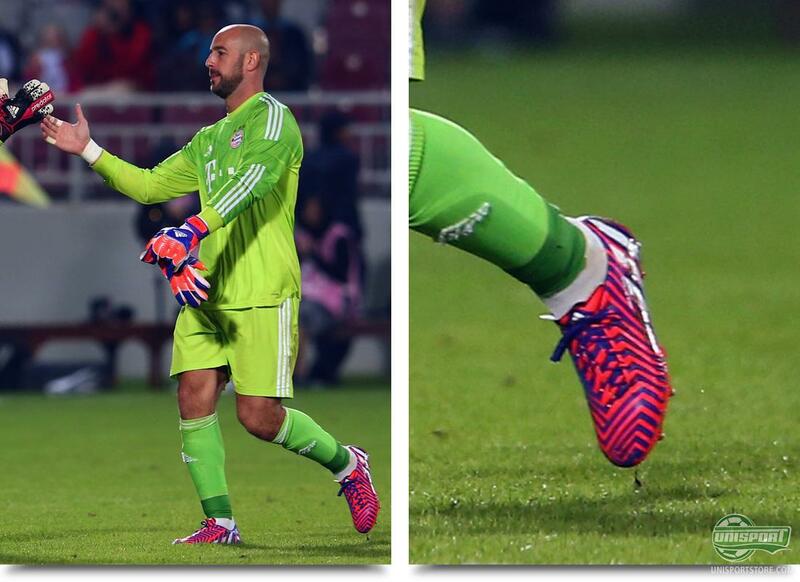 They played a training match yesterday evening, where goalkeeper Pepe Reina wore a new colourway for the adidas Predator – and you just have to say, it couldn’t be a better fit for the Bayern kit. David Alaba (Bayern Munich) – adidas F50 Adizero Solar Red/White/Core Black Another player, who couldn’t keep his hands off the new colourways, is the Austrian superstar David Alaba, who tested the coming F50 adizero model. From what we can see, we can expect a new upper and a brand new stud-configuration. 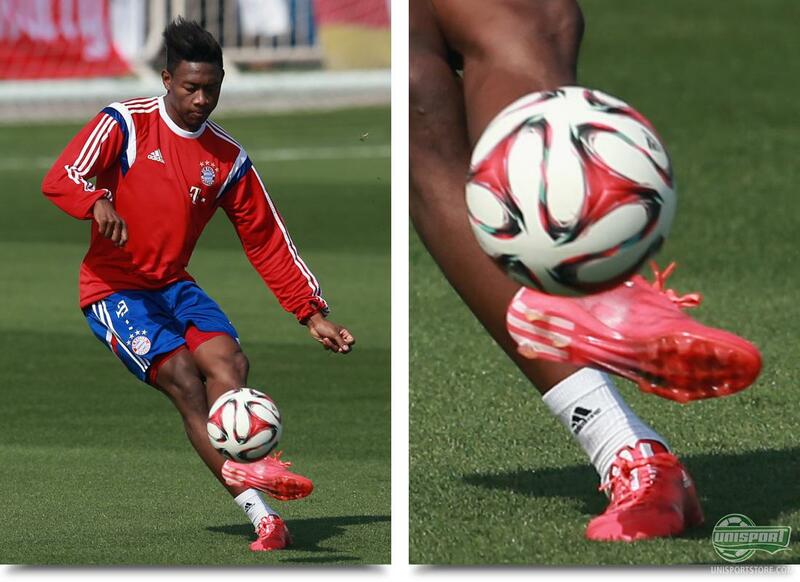 And wait, isn’t that three studs on the heel of Alaba’s boots…? Holger Badstuber (Bayern Munich) – adidas Predator Instinct Solar Red/White/Night Flash Pepe Reina wasn’t the only player, who wore the new Predator Instinct colourway – if nothing else that means Holger Badstuber and Reina both forgot to read the memo that told them to juuuuust wait with wearing the new colourway. Judging from the picture Badstuber had a fairly relaxed training and wasn’t scared to show off his new Predator boots. Cheers Holger! Bastian Schweinsteiger (Bayern Munich) – adidas F50 Adizero Solar Red/White/Core Black Did you think we were done with Bayern? No, no no– Bastian Schweinsteiger made sure of that, when he wore the new F50 Adizero in training. Schweini made things interesting by showing off what is either a specially stitched boot, or a leather upper… It won’t be long before we can unveil the next generation adizero, so stay posted! Christoph Kramer (Borussia Mönchengladbach) – adidas 11Pro White/Blue Custom Mr. Kramer has also given us the first glimpse at what could well be a new colourway for the adidas 11Pro in a white and blue model. In any case the young defensive midfielder trained in the modern classic during Gladbach’s trip away from Germany – and the sharp viewer may have noticed that Kramer has had the upper specially made with extra stitches, so it resembles the 11Pro II. It has its advantages being a professional player. Cristiano Ronaldo (Real Madrid) – Nike Mercurial CR7 Rare Gold It was however not just Gareth Bale, who was testing new boots at training – the Ballon d’Or 2014 winner was also sporting something new and was naturally wearing his new CR7 Rare Gold-boots, which have been hand made for the Portuguese superstar, who won the honour as the world’s best footballer for the third time. We expect CR7 to crack out the boots against Atletico Madrid tonight. What do you think about the many new boots, we have been given a sneak peek into the future – are you looking forward to seeing more and which boot are you most excited to see? Share your thoughts with us in the box down below.